Lo Shu Square (simplified Chinese: 洛书; traditional Chinese: 洛書; pinyin: luò shū; also written 雒書; literally: Luo (River) Book/Scroll), or the Nine Halls Diagram (simplified Chinese: 九宫图; traditional Chinese: 九宮圖; pinyin: jiǔ gōng tú), is the unique normal magic square of order three (every normal magic square of order three is obtained from the Lo Shu by rotation or reflection). The Lo Shu is part of the legacy of ancient Chinese mathematical and divinatory (cf. the I Ching 易經) traditions, and is an important emblem in Feng Shui (風水), the art of geomancy concerned with the placement of objects in relation to the flow of qi (氣) "natural energy". A Chinese legend concerning the pre-historic Emperor Yu (夏禹) tell of the Lo Shu, often in connection with the Yellow River Map (Hetu) and 8 trigrams. In ancient China there was a huge deluge: the people offered sacrifices to the god of one of the flooding rivers, the Luo river (洛河), to try to calm his anger. A magical turtle emerged from the water with the curiously unnatural Lo Shu pattern on its shell: circular dots representing the integers 1 through 9 are arranged in a three-by-three grid. The Lo Shu square on the back of a small turtle (in the center), surrounded by the signs of the Chinese zodiac and the Eight trigrams, all carried by a large turtle (which, presumably, stands for the Dragon horse that had earlier revealed the trigrams to Fu Xi). This example drawn by an anonymous Tibetan artist. The Lo Shu is sometimes connected numerologically with the Ba Gua 八卦 "8 trigrams", which can be arranged in the 8 outer cells, reminiscent of circular trigram diagrams. Because north is placed at the bottom of maps in China, the 3x3 magic square having number 1 at the bottom and 9 at the top is used in preference to the other rotations/reflections. As seen in the "Later Heaven" arrangement, 1 and 9 correspond with ☵ Kǎn 水 "Water" and ☲ Lí 火 "Fire" respectively. In the "Early Heaven" arrangement, they would correspond with ☷ Kūn 地 "Earth" and ☰ Qián 天 "Heaven" respectively. 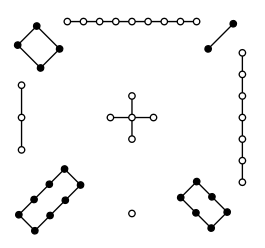 Like the Ho Tu (河圖), the Lo Shu square, in conjunction with the 8 trigrams, is sometimes used as a mandalic representation important in Feng Shui (風水) geomancy. ^ Swaney, Mark. "Mark Swaney on the History of Magic Squares". Archived from the original on 2004-08-07. Schuyler Cammann, The Magic Square of Three in Old Chinese Philosophy and Religion, History of Religions, Vol. 1, No. 1 (Summer, 1961), pp. 37-80. Yoshio Mikami, The Development of Mathematics in China and Japan, 1913, Library of Congress 61-13497. Frank J. Swetz, The Legacy of the Luoshu, A. K. Peters / CRC Press; 2nd Rev Ed edition (16 June 2008), ISBN 978-1-56881-427-8.